I keep meaning to do a links round-up, so before I forget, reviews of Reckless Endangerment, the book on the GSEs (that cover similar ground as the Wallison/Pinto argument) by Gretchen Morgenson and Josh Rosner, are starting to happen. Jeff Madrick at NYRB’s Blog, Bob Kuttner at The American Prospect and Kevin Drum all have interesting, very critical, things to say about the book. Meanwhile, Tyler Cowen asks How much did Fannie and Freddie cause the financial crisis?, trying to reground the debate over the GSEs in firmer soil with five points. Many others are answering this question by looking at the collapse moment; I want to focus on the origination of bad mortgage debt and the bubble itself. I pinged David Min to see if he wanted to respond, and I throw his arguments in with my own below. David Min: “This conflates outstanding mortgages vs. annual mortgage originations (sort of like a snapshot vs. a video). The GSEs were guaranteeing nearly half of all mortgages in the late 1990s and early 2000s. But from 2002-2005, they saw a fairly precipitous drop in market share, going from about 50% to just under 30% of all mortgage originations. Conversely, private label securitization [PLS] shot up from about 10% to about 40% over the same period. This is, to state the obvious, a very radical shift in mortgage originations that overlapped neatly with the origination of the most toxic home loans. I think that’s right. So far the debate has been focused on the idea of “other high-risk mortgages,” mortgages with an LTV > 90, for instance. The real split should be between PLS, the brand new private-market way of putting together the mortgage market, and non-PLS. For #2 Cowen brings up leverage. I’d say if we want to understand how leverage got into the mortgage market specifically, we should look at subprime as well as second-liens and other junior-lien mortgage claims, and what arguments were given for supporting them. My favorite document of what that argument looked liked at the time is something like Charles Calomiris and Joseph R. Mason 1999 AEI paper: High Loan-to-Value Mortgage Lending: Problem or Cure? That is all about how people should lever up as much as they can as a signaling device, as the junior claims will disrupt bad debt workouts and act as a straightjacket on credit writedowns. This is explicitly not an affordability mission, but instead a very conservative vision of bankruptcy law and debtor-creditor relationships. We are living through the consequences of that call. This extra option to re-lever to consistently re-bid against property appreciation goes hand-in-hand with dynamics of a bubble. For #3, Arnold Kling has clarified his previous thoughts on the GSEs here in a way that I think works better with the data. Also another point I don’t see brought up enough is that the GSEs had political pressures to purchase private-label mortgages in 2007 as the credit market was freezing up, in a desperate attempt to unlock it. This argument, and the graph above, is developed in Roosevelt Institute senior fellows Rob Johnson and Tom Ferguson’s Too Big to Bail: The ‘Paulson Put,’ Presidential Politics, and the Global Financial Meltdown Part II. One could easily assume that they were buying the worst loans here, aggregating losses on the GSEs. I’d love to see much more investigations into this (more on that paper the the situation here). Meanwhile, research moves on. Mian and Sufi’s The Consequences of Mortgage Credit Expansion: Evidence from the U.S. Mortgage Default Crisis is likely to be with us for a while as a research standard, and it is telling us to look at the securitization chain. In response the the “banks repaid the bailout, GSEs have not” point, I think there is a least one more GSE-relevant point to make, besides the Paulson Put issue you correctly identify. At the end of 2007, GSE-issued securities were around 9% of the assets of both commercial banks and broker/dealers (ie, the TARP recipients). The GSE bailout protected those investments, which would likely otherwise have dropped much more in value, thereby worsening the solvency issues faced by the banks/dealers. And that doesn’t even get into AIG! Thanks again for collecting and organizing this stuff. But the point THIS argument papers over is critical – PLS credit risk was widely diversified, but the GSE’s were concentrated holders of credit risk, AND GSE’s were undercapitalized for that risk. AND GSE paper was used to prime the rest of the financial system. That is why they can be said to be a principal cause of the financial crisis. Even if they did “better” than PLS originators and buyers, it wasn’t good enough for a highly levered keystone of the financial system. I think that sets a bar for causation way too low. Saying that they made it possible for bad choices to be made via a backstop argument when the entire purpose of the market is for people to (in theory) do their own due diligence in seeking their own self-interest. This whole discussion about RE (reckless endangerment) is kind of fascinating and bside the point at the same time. Fascinating, because you have a lot of intelligent people blogging on it, and you can see the arguments getting put forth, examined, refined or discarded in real time – its almost liike attending a seminair. Beside the point: you can argue all you want about how many mortgages of what quality the GSEs were holding when, but there remains a fundamental psychological fact (and, after all, econ is mostly psychology): If the GSEs, and their C suite execs, had had even the slightlest amount of honesty and interest in the public good, the mortage disaster would not have happened. If the CEO of Fan/Fred had gone to congress, or appeared on 60minutes, or wherever it is you go now, and said, hey GS is securitizing garbage from Mozillo, the whole thing would have been shut down. Most people are missing the point by focusing on subprime and default rates. The housing bubble was caused by the AGGREGATE demand for houses. Prime and subprime borrowers competed side by side in many markets, with subprime paper allowing otherwise prime borrowers to expand their bidding potential. Other markets were segmented, which is why low priced housing appreciated faster and fell harder than higher priced homes. Fannie and Freddie were the market leaders in MBS issuance EVERY year, including the years when their combined share was less than 50%. The top private issuer, Countrywide, was in a distant third place and the GSEs had higher market share than the top 10 private labels combined. What does that tell us about market power? Don’t ever forget that they were always ranked #1 and #2. Their share of total mortgage debt outstanding is relevant because every loan they purchased provided the liquidity for banks to originate more loans. As prices went higher and banks climbed down the credit ladder looking for customers willing and able to buy, obviously the marginal unit of credit deteriorated. But it wasn’t the marginal unit that created the bubble. Lots of units before them were in for the ride up! And the GSEs financed more than half of those mortgages. Also note that there were a lot of nonconforming (jumbo) loans in high cost markets that’s GSEs couldn’t buy, but these went to high income borrowers with good credit. So the share GSEs did not buy included a large volume of high quality loans. 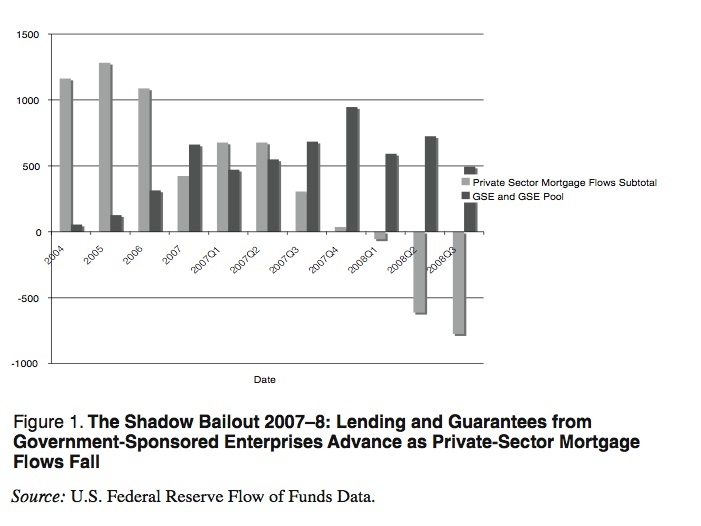 The GSEs were the first movers, and they scarfed up almost all of the conforming, high quality loans. That left the residual market with all the riskier loans by default. Of course the private label default rates are higher! The GSEs also bought a lot of paper from these subprime lenders such as Countrywide, IndyMac, and WaMu. What does it matter that Countrywide wasn’t subject to CRA if they were selling loans of low to moderate income borrowers to Fannie and Freddie who were getting affordable housing credit for them? CRA wasn’t the culprit, but it was a co-conspirator in the affordable housing government mandate. Subprime loans were the first and worst to default, and we got a cold chill from the poor underwriting we saw after the fact. But prime loans still represented the majority of loans. It isn’t the LAST straw or the HEAVIEST straw that breaks the camel’s back, but ALL of them in combination. Fannie and Freddie grew their market share every year since at least 1990 in a rapidly growing market. When their share declined, it was only because of their accounting scandals. Congress told them to get back into the game. There are also the Federal Home Loan Banks – the OTHER GSEs. They contributed a substantial amount of funding for loan growth in this crisis both for residential and commercial loans. FHLBs were also major purchasers of GSE and private label MBS. 10% of FHLB profits were required by law to be poured into affordable housing. The FHA and VA also increased their volumes of government subsidized mortgages. Is everyone beginning to see the complete picture here? The filthy fingerprints of GOVERNMENT are all over the murder weapons. I guess people can talk themselves into anything if they never adjust their conclusions after looking at facts(not to mention ignoring or mistating real facts). Particularly appaling is the oft stated “subprime lenders sold mortgages to other banks who received CRA credit for those loans” inanity. Did that happen? Absolutely. It would be almost impossible for it not to happen when you understand that about 5-6% of the US population lives in CRA areas. But the question is how often did it happen. And the facts are known but ignored by those whose conclusions were set before the facts came out. Countrywide sold less than 2% of its paper to CRA institutions. But people like you will keep saying the same tired old falsehoods, and among your friends you will all complain about how “those people” melted the world’s economy. Your world view is funny in a way, as the same exact thing happened at the exact same time in Europe without the prescense of the CRA or the GSEs. But that simple fact is ignored, as is the simple fact that the one constant between Europe and the US were the investment banks, and many of them were present on both sides of the Atlantic. It is a helluva coincidence isn’t it? Working individually, the governments of the US, the UK, Spain, Australia, Ireland, Romania, Poland, Denmark, Singapore, the Netherlands, South Korea, Israel and a few other places enacted policies that led to all those countries having housing bubbles at the same. Crazy, man. In a civilized society, we don’t let demand drive things. We don’t let the “demand” for tobacco drive supply…or we try. so, in a civilized society, we control advertising; you can’t advertise tobacco to minors. just one more time, for the slow and hard of hearing: the bubble was caused by CRIMMINAL actions on the part of the mortgage originators (see articles by morgenson, NYT) abetted by the wall street banks. This is a really bizarre argument. Essentially you are arguing that some actor’s good behavior encouraged other actors to engage in bad behavior. therefore, the good actors are just as guilty as the bad actors for the consequences. It’s like this: white shoes law firms are responsible for drug murders because those firms keep paying associates more and more, and demanding that those associates work more and more, which results in the highly paid associates scoring more and more cocaine, driving up the price of cocaine, creating more competition in the cocaine-dealing market, resulting in more drug-related violence. The implicit assumption in Mike’s comment is that there is a set amount of mortgages that the private market has to originate, just because they originated a similar amount the previous year. It’s also an assumption of Wallison and Pinto, and it’s completely wrong. Firms can and do exit markets when their profit margins become too thin. But it’s worse than that. Private firms were expanding their capacity. Why? Wallison and Pinto would like you to believe that this was because F/F purchases drove home prices up and lulled people into believing that the mortgages were safe. Completely false. Wall Street created CDOs because investors knew that the BBB tranches were crap. Consequently, they had to “create the investor” (an investment banker’s words) by wrapping them up with other BBB tranches and finding ill-informed patsies (mostly monoline bond insurers) to write CDS on them. Investment bankers also fudged the due diligence reports from Clayton Holdings et al. because they knew that they were selling crap. Min is exactly right. Internally (I worked at Fannie) the decision was made that Fannie was leaving too much money on the table and it was time to chase Alt-A (first) and then subprime (second). They had previously stayed out because they thought the market was mispricing as early as 2003, but by 2005 the thinking was we (ie Fannie) were wrong and missing a fundamental shift in the market and we had chase it (one of Freddie’s C-level guys made the same comment in 2008 to a reporter). In other words, Fannie dove in the pool as it was being drained. Indeed. There’s a long presentation (http://fcic.law.stanford.edu/documents/view/389) that lays out the internal discussion in detail. I just finished Reckless Endangerment, and IT DOES NOT SUPPORT WALLISON AND PINTO’S ARGUMENT. Please, somebody, read it yourself and shout from the rooftops, THIS DOES NOT SUPPORT WALLISON AND PINTO’S ARGUMENT. Wallison and Pinto argued that the government, in the form of affordable housing goals, forced Fannie and Freddie to make subprime mortgages. They EXPLICITLY DISAVOWED the notion that F/F were motivated by profit. Morgensen and Rosner make clear that the causation goes the opposite way. F/F, and especially CEO Johnson, were using affordable housing as a fig leaf to enable them to lever up, grow their balance sheet, and reap huge profits (and executive bonuses). It was the private sector capturing the political system for private gain, not the victory of politics over business judgment. Indeed, Morgensen and Rosner say that the GSEs provided a template that banks later used to run roughshod over the political system. Behind it all is the subsidy created by the implicit government guarantee. I often wondered why Wallison did not focus on this part, as it makes a clear connection between public policy and the corruption of the private market, and he probably could get more widespread agreement on it. (I certainly think it was a factor.) But then I figured it out–making that argument would make the GSEs similar to the TBTF banks, and that wouldn’t do. Wallison is the most intellectually dishonest person I’ve ever run across. If you look at his past writings, you’ll see that he’s argued both sides of the same questions, with the only consistency being that the arguments are always anti-GSE. Wallison showed his cards in the email about Dodd-Frank publicized in the Democratic report on the FCIC. His sole purpose has always been to protect the banks, and his ideas are entirely subservient to that goal. Sorry for so many comments, but the lazy thinking around this topic really gets me steamed. Of course “banks recovered and paid back virtually all of their bridge/bailout.” If someone lowers the cost of your raw material to zero (the Fed funds rate), and you have access to a riskless investment (Treasuries), you can’t help to make money. In addition, pliable regulators made sure that nothing would put them into bankruptcy (e.g., the relaxation of mark-to-market accounting).